The epidemiology of exacerbations of chronic obstructive pulmonary disease (COPD) is reviewed with particular reference to the definition, frequency, time course, natural history and seasonality, and their relationship with decline in lung function, disease severity and mortality. The importance of distinguishing between recurrent and relapsed exacerbations is discussed. The prevalence of chronic obstructive pulmonary disease (COPD) is increasing worldwide, as is tobacco usage.1 Periods of acute worsening of this disease termed exacerbations—which greatly affect the quality of life and health of patients with COPD2—will therefore place a greater burden on the health services. Exacerbations can require physician consultation in primary and secondary care, may result in admission to hospital, and eventually lead to death. The epidemiology of these events is therefore important for both the understanding of the disease process and in assessing therapeutic outcomes. The precise definition of an exacerbation is a controversial topic. Exacerbations have been defined using respiratory symptoms alone (symptom-based), or symptoms plus an event such as the prescription of medication by a general practitioner or hospital admission for an acute exacerbation.3 Both approaches have merits and disadvantages and, as yet, there is no consensus. To date, no sputum or plasma biomarker has been found that, with good sensitivity and specificity, can identify either the presence or severity of an exacerbation. This may be due to heterogeneity in the aetiology of exacerbations, delay between onset and presentation of the exacerbation for sampling of the biomarker, or shifts in the baseline (stable) levels with age or disease severity. Exacerbation rates reported for symptom-based studies tend to be higher than for event-based studies because previous studies have shown that about 50% of exacerbations will not be reported to the research team.4,5 This is to be expected as patients with COPD may not understand their disease and the importance of seeking treatment,6–8 they may be depressed, or lack mobility. It is not certain whether unreported exacerbations are sufficiently mild that they can be dismissed. Little is known about the nature of these particular exacerbations as, by definition, unreported exacerbations are not seen by healthcare professionals. However, we have observed that patients who report a smaller proportion of their exacerbations tend to have a poorer health related quality of life.8 This difference could be explained by the fact that these patients do not receive treatment and consequently their exacerbations take longer to recover and have a greater impact on patients’ perception of their disease. Patients can experience a wide variety of symptoms during an exacerbation. It is generally agreed that the most distinct or cardinal symptoms of an exacerbation are increased dyspnoea, sputum purulence, and sputum volume.9 Anthonisen et al9 graded these exacerbations into type 1 (all three cardinal symptoms), type 2 (two cardinal symptoms), and type 3 (one cardinal symptom plus one of the following: an upper respiratory tract infection in the past 5 days, fever without other cause, increased wheezing or cough, or an increase in heart rate or respiratory rate by 20% compared with baseline readings). However, patients may also present with other symptoms such as worsening exercise tolerance, fluid retention, increased fatigue, acute confusion, or general malaise.10 There are small falls in peak expiratory flow (PEF), forced expiratory volume in 1 second (FEV1), and forced vital capacity (FVC) at exacerbation, indicating narrowing of the airways through a variety of mechanisms.4 Arterial blood gases and oxygen saturation may also worsen, and severe exacerbations may progress to respiratory failure. 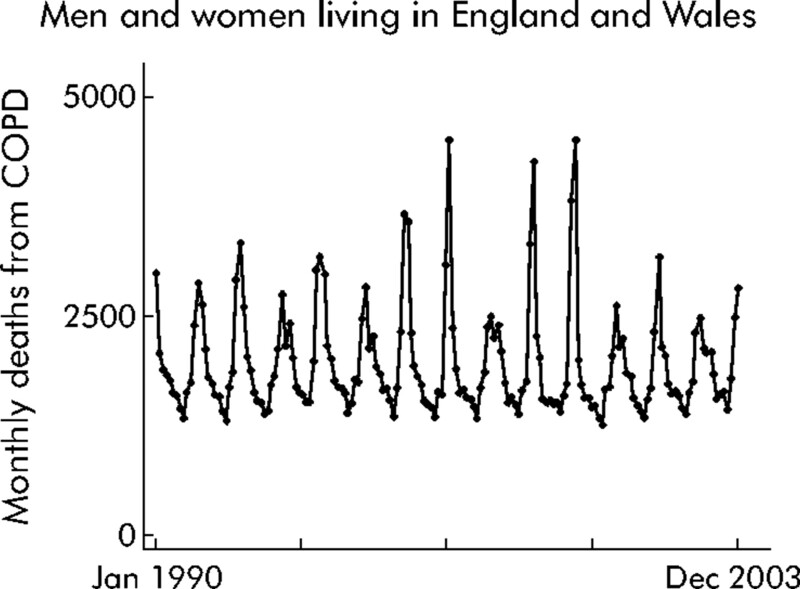 Figure 1 shows the monthly deaths from COPD in England and Wales for 1990–2003. It is projected that COPD will be the third leading cause of death worldwide in 2020.11 There can be a number of causes recorded on death certificates due to the respiratory manifestations of COPD. Using the 9th International Classification of Disease (ICD) the codes were 490–492 and 496, and in the 10th ICD they are J40–J44. Most of these causes of death do not refer specifically to exacerbation. However, it is likely that patients at the terminal stage of COPD fulfil any definition of an exacerbation. Other exacerbation-related deaths may be attributed to related conditions (co-morbidities) such as arrhythmias, pulmonary embolism, or ischaemic heart disease. The use of death registration data may therefore not give the true picture on mortality due to exacerbation. Monthly deaths from COPD (ICD9 490–492 and 496 for years before 2001 and ICD10 J40–J44 thereafter) at any age for men and women living in England and Wales. To be compatible with deaths in 1990–1992, data for the years from 1993 were divided by 0.920 to adjust for differences in coding instructions; deaths for 2001–2003 were then divided by 0.966 to allow for differences between ICD9 and ICD10. Data from the UK Office of National Statistics. Soler-Cataluña et al14 have recently shown that mortality is significantly related to the frequency of severe exacerbations requiring hospital care, independently of age, Charlson co-morbidity index, body mass index (BMI), FEV1 % predicted, or long term oxygen therapy in a cohort of 304 men studied over 5 years. There is an important caveat to all these data—they refer to deaths of patients whose exacerbation or underlying disease is sufficiently severe or life threatening to warrant admission to hospital. Most exacerbations are treated in the community and do not result in death. The statistics for exacerbation related mortality should therefore always be qualified by the disease stage. One indication of the burden imposed by COPD exacerbations (defined here as ICD10 code J44) is that they were responsible for more than 0.9% of all 11.7 million hospital admissions and 2.4% of the 4.2 million acute medical admissions in England for 2003/2004. To place this in context, the equivalent figures for asthma (ICD10 code J45) are 0.56% and 1.3%, respectively. There has been a steady rise since the early 1990s in the number of admissions to hospital for COPD. This is despite the fact that relatively few patients with an exacerbation are admitted, with most being treated on an outpatient basis. Table 1 shows recent data from the hospital episode statistics published by the Department of Heath for the financial years from 1998 to 2003. The number of admissions for COPD has risen by 13.1% over this period, with the proportion of men admitted rising from 72% to 79%. Most of these admissions are on an emergency basis. Despite these increasing pressures on the health service, the mean length of stay has remained almost unchanged at about 10 days. A number of studies have examined the impact of exacerbations on primary care consultations. Miravitlles et al18 reported data on 1001 patients seen in 201 Spanish practices. The median number of exacerbations seen in primary care was two per year, with 309 patients (31%) suffering three or more exacerbations in 1 year. McGuire et al19 estimated the number of GP consultations for chronic bronchitis and acute exacerbations in excess of the number of visits by the general population. They relied mainly on the General Practice Research Database (1994–5) in which the diagnosis and long term treatment of a chronic condition is recorded only once. These consultation data therefore refer to exacerbations rather than the stable disease. They reported an average of 4.01 GP visits per year in the 45–54 age range, 4.51 visits per year in the 55–64 age range, 3.6 per year in the 65–74 age range, 1.46 visits per year in the 75–84 age range, and −0.30 visits per year in those aged over 85 years. The decline in the number of visits with age probably reflects increased consultations for other causes in people without chronic bronchitis rather than a reduction in the number of consultations for acute exacerbations. There is a subgroup of patients with COPD who experience an above normal number of exacerbations. A figure of 2.5 or 3 exacerbations per year is normal with a symptomatic definition of an exacerbation. These patients have a poorer quality of life,2 higher inflammatory markers when stable,20 and a faster decline in lung function (see below). They are more likely to become housebound,21 to experience more colds,22 and to be chronic sputum producers.23 They are prone to readmission to hospital15,24 and frequent severe exacerbations are associated with increased mortality.14 This propensity towards frequent exacerbation appears for the most part to be independent of disease severity. The poor health and prognosis of this subgroup of patients suggests that they warrant targeting with further therapeutic interventions. The seminal work of Fletcher and colleagues25 on 792 smokers and non-smokers, with and without respiratory disease, suggested that lower respiratory tract infections played no role in the annual decline in FEV1. This conclusion was supported by Howard et al26 who followed a similar group for 11 years and by Bates et al27 in a 12 year study of male war veterans. However, indirect evidence that exacerbations contributed to the decline in FEV1 continued to be reported even after these publications. Exacerbations were found to be more frequent in those with regular sputum production, and regular sputum production was reported to be associated with an accelerated decline in FEV128 and with death.29 Data from our group4 also showed that PEF did not recover to pre-exacerbation levels within 91 days in 7.1% of exacerbations. This indicated that exacerbations could produce a permanent reduction in lung function, which suggested that patients who experienced more exacerbations would have a faster decline than those with fewer exacerbations. Three studies have now shown that exacerbations play a role in the decline in FEV1. The Lung Health Study,30 a 5 year prospective randomised multicentre study of smoking cessation, monitored 5887 smokers aged 35–60 years. Spirometric parameters and the number of lower respiratory tract infections resulting in a physician visit (LRTI) were recorded annually. The analysis showed no relationship between LRTI and FEV1 decline in patients who stopped smoking completely but, in those who smoked intermittently or continuously, FEV1 declined by 7.3 ml/year (p<0.05) and 7.1 ml/year (p<0.001), respectively, for each additional LRTI per year. Donaldson et al31 examined 109 patients of median age 68.1 years with moderate to very severe COPD over a 4 year period. An additional decline in FEV1 of 8.0 ml/year and in PEF of 2.22 l/min/year was seen in COPD patients who experienced frequent exacerbations (⩾2.92 exacerbations per year) compared with those who had fewer exacerbations. 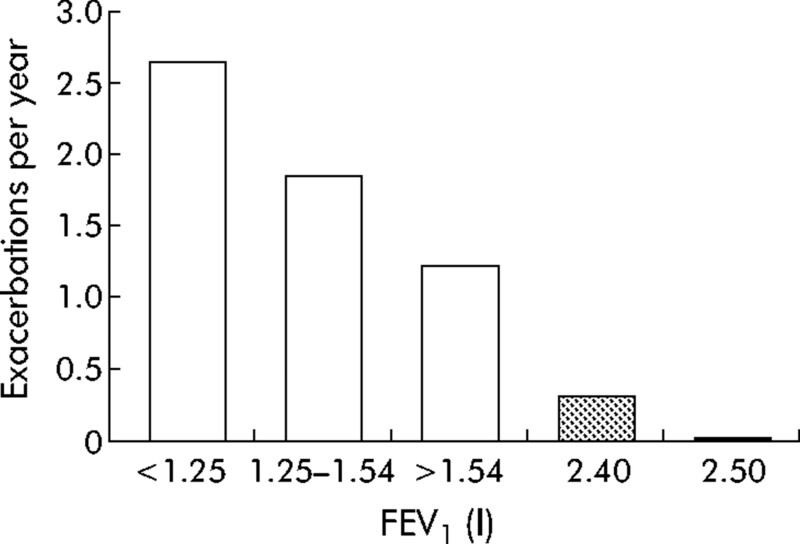 Dowson et al,32 investigating patients with emphysema due to α1-antitrypsin deficiency, found a positive correlation between exacerbation frequency and decline in FVC for the group as a whole (n = 43) and in FEV1 for 26 patients with a baseline post-bronchodilator FEV1 >35% predicted. There seems to be a general consensus that exacerbation frequency increases with disease severity. Figure 2 shows the number of exacerbations per year in relation to FEV1. Here, exacerbations were identified using an event-based definition and data were combined from three studies (the ISOLDE Study, the European Respiratory Society Study on COPD, and the Copenhagen City Lung Study).33 Using a symptom-based definition, we reported that patients with severe COPD (GOLD category III, n = 38) had an annual exacerbation frequency of 3.43 per year compared with 2.68 per year in those with moderate COPD (GOLD II, n = 94; p = 0.029).34 Greenberg et al35 found that respiratory illnesses—defined as increased cough, shortness of breath, or sputum production and/or a change in sputum colour—were more frequent in patients with moderate COPD (3 per year) than in those with mild COPD (1.8 per year). Miravitlles et al18 also reported that exacerbations, using a symptom-based definition, increased with disease severity. With an FEV1 of >60% predicted the mean (SD) number of exacerbations per year was 1.6 (1.5), compared with 1.9 (1.8) with FEV1 59–40% and 2.3 (1.9) with FEV1 >40%. A similar pattern in recovery, but of a longer duration of up to several months, was seen in the time course of health status. Data from the GLOBE study, a randomised double blind trial of antibiotic therapy, showed that health related quality of life assessed by the total score from the St George’s Respiratory Questionnaire fell (that is, patients felt better) by 11.8 units at 4 weeks and by a further 4.6 units at 12 weeks after an exacerbation.37 More acute changes have been observed in the time spent outside the home during an exacerbation.21 Typically, 32–35% of all patients stayed indoors on any day when stable, but this rose to 45% at exacerbation onset, peaked at 48% on the day after onset, and returned to baseline levels by 14 days. The longer duration of worsening health status compared with lung function suggests that exacerbations have a lasting impact. This could be anticipated as episodes of severe, possibly life threatening, dyspnoea would be difficult to overlook. Little work has been done on how the severity and symptom composition of exacerbations changes over time. In our cohort study34 we asked patients to record any worsening in their normal stable condition. Patients therefore recorded increased dyspnoea or onset of a new symptom such as a sore throat. We found that the number of symptoms above normal at exacerbation increased by 0.05 per year (p = 0.047), and that the number of days it took to recover from an exacerbation in terms of symptoms and FEV1 took longer in successive years (0.32 and 0.55 days per year; both p<0.05). We also found that sputum purulence at exacerbation became more common over time, increasing by 4.1% per year (fig 3. Changes over time in the percentage of exacerbations involving increased dyspnoea, sputum volume, or sputum purulence on the day of onset. The x axis is time from the date patients enrolled in the study, thus standardising for differences in the time when the patients started and ended the study. Circle size indicates the number of exacerbations recorded in that quarter year. Adapted from Donaldson et al34 with permission of European Respiratory Society Journals Ltd. 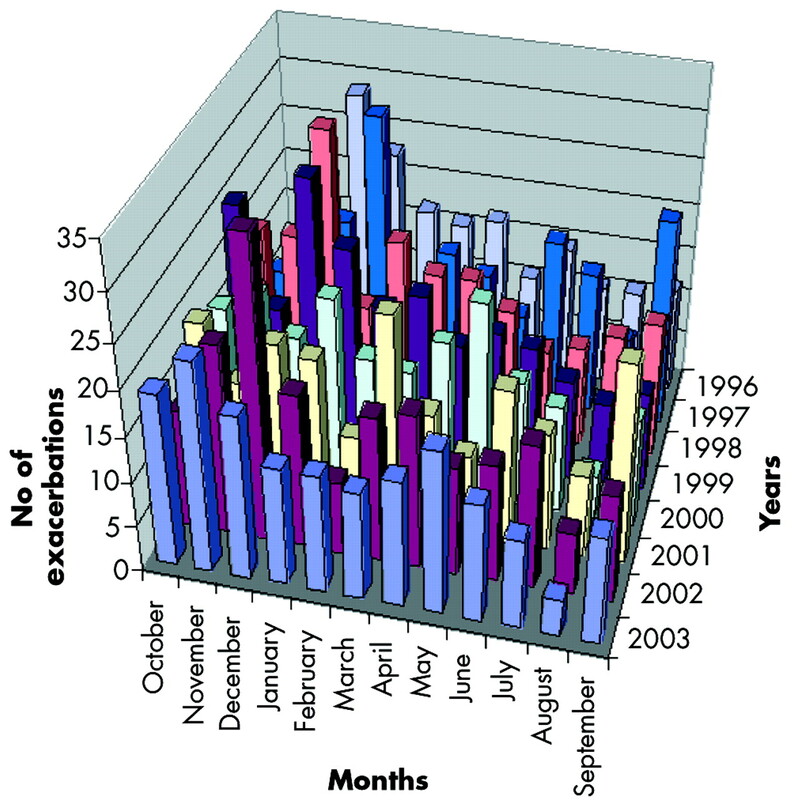 Number of exacerbations experienced by patients in the East London COPD study by calendar month and years 1996–2003. More exacerbations were seen in the winter months (November to February) than in the summer. Data from our COPD cohort. It is now recognised that exacerbation frequency is an important outcome measure in COPD. To advance our understanding of frequent exacerbations we need to classify exacerbations further. It has been reported that approximately 30% of patients seen at hospital with an exacerbation will be seen again and possibly admitted with another exacerbation within 8 weeks.40,41 The term “recurrent” has also been used to describe repeat admissions for acute hypercapnic respiratory failure.42 It would be helpful to use this term to describe exacerbations that are new events, following close on from an earlier index exacerbation, but with an intervening period of usual (relatively good) health. Recurrent exacerbations would be distinct from relapsed exacerbations where, during the course of the exacerbation, the patient’s health worsens and an additional intervention is required. At no time during the relapsed exacerbation does the patient recover to his/her normal health. Further research is required to study both relapsed and recurrent exacerbations. Exacerbations are now recognised as an important outcome measure in COPD. In the last 10 years frequent exacerbations have been shown to be associated with poorer health outcomes and a greater burden on the health service. The future challenge lies in understanding the causes of frequent exacerbations, differences in exacerbation severity, and the failure of some exacerbations to resolve. Lopez AD, Murray CC. The global burden of disease, 1990–2020. Nat Med1998;4:1241–3. Pauwels R, Calverley P, Buist AS, et al. COPD exacerbations: the importance of a standard definition. Respir Med2004;98:99–107. Miravitlles M, Ferrer M, Pont A, et al. Effect of exacerbations on quality of life in patients with chronic obstructive pulmonary disease: a 2 year follow up study. Thorax2004;59:387–95. Rennard S, Decramer M, Calverley PMA, et al. Impact of COPD in North America and Europe in 2000: subjects’ perspective of confronting COPD international survey. Eur Respir J2002;20:799–805. Okubadejo AA, Jones PW, Wedzicha JA. Quality of life in patients with chronic obstructive pulmonary disease and severe hypoxaemia. Thorax1996;51:44–7. Wilkinson TMA, Donaldson GC, Hurst JR, et al. Early therapy improves outcomes of exacerbations of chronic obstructive pulmonary disease. Am J Respir Crit Care Med2004;169:1298–303. Anthonisen NR, Manfreda J, Warren CP, et al. Antibiotic therapy in exacerbations of chronic obstructive pulmonary disease. Ann Intern Med1987;106:196–204. National Institute for Clinical Excellence (NICE). Management of exacerbations of COPD. In: Chronic obstructive pulmonary disease: national clinical guideline on management of chronic obstructive pulmonary disease in adults in primary and secondary care, Thorax2004;59 (Suppl I) :131–56. Patil SP, Krishnan JA, Lechtzin N, et al. In-hospital mortality following acute exacerbations of chronic obstructive pulmonary disease. Arch Intern Med2003;163:1180–6. Roberts CM, Barnes S, Lowe D, et al. Evidence for a link between mortality in acute COPD and hospital type and resources. Thorax2003;58:947–9. Soler-Cataluña JJ, Martínez-García M Á, Román Sánchez P, et al. Severe acute exacerbations and mortality in patients with chronic obstructive pulmonary disease. Thorax2005;60:925–31. Roberts CM, Lowe D, Bucknall CE, et al. Clinical audit indicators of outcome following admission to hospital with acute exacerbation of chronic obstructive pulmonary disease. Thorax2002;57:137–41. Groenewegen KH, Schols AM, Wouters EF. Mortality and mortality-related factors after hospitalization for acute exacerbation of COPD. Chest2003;124:459–67. Miravitlles M, Mayordomo C, Artés M, et al. Treatment of chronic obstructive pulmonary disease and its exacerbations in general practice. Respir Med1999;93:173–9. McGuire A, Irwin DE, Fenn P, et al. The excess cost of acute exacerbations of chronic bronchitis in patients aged 45 and older in England and Wales. Value Health2001;4:370–5. Bhowmik A, Seemungal TA, Sapsford RJ, et al. Relation of sputum inflammatory markers to symptoms and lung function changes in COPD exacerbations. Thorax2000;55:114–20. Donaldson GC, Wilkinson TM, Hurst JR, et al. Exacerbations and time spent outdoors in chronic obstructive pulmonary disease. Am J Respir Crit Care Med2005;171:446–52. Hurst JR, Donaldson GC, Wilkinson TMA, et al. Epidemiological relationships between the common cold and exacerbation frequency in COPD. Eur Respir J2005;26:846–52. Powrie DJ, Wikinson TM, Donaldson GC, et al. Chronic sputum production in COPD is associated with increased airway inflammation and exacerbation frequency. American Thoracic Society Meeting. 2005;140: F88 (abstract),. Garcia-Aymerich J, Monso E, Marrades RM, et al. Risk factors for hospitalization for a chronic obstructive pulmonary disease exacerbation: EFRAM study. Am J Respir Crit Care Med2001;164:1002–7. Fletcher C, Peto R, Tinker C, et al.The natural history of chronic bronchitis and emphysema. Oxford: Oxford University Press, 1976. Howard P. A long-term follow-up of respiratory symptoms and ventilatory function in a group of working men. Br J Ind Med1970;27:326–33. Bates D. The fate of the chronic bronchitic: a report of the 10-year follow-up in the Canadian Department of Veteran’s Affairs coordinated study of chronic bronchitis. Am Rev Respir Dis1973;108:1043–65. Vestbo J, Prescott E, Lange P. Association of chronic mucus hypersecretion with FEV1 decline and chronic obstructive pulmonary disease morbidity. Copenhagen City Heart Study Group. Am J Respir Crit Care Med1996;153:1530–5. Prescott E, Lange P, Vestbo J. Chronic mucus hypersecretion in COPD and death from pulmonary infection. Eur Respir J1995;8:1333–8. Kanner RE, Anthonisen NR, Connett JE. Lower respiratory illnesses promote FEV1 decline in current smokers but not ex-smokers with mild chronic obstructive pulmonary disease. Am J Respir Crit Care Med2001;164:358–64. Dowson LJ, Guest PJ, Stockley RA. Longitudinal changes in physiological, radiological, and health status measurements in alpha(1)-antitrypsin deficiency and factors associated with decline. Am J Respir Crit Care Med2001;164:1805–9. Burge S, Wedzicha JA. COPD exacerbations: definitions and classifications. Eur Respir J2003;21 (Suppl 41) :46–53s. Donaldson GC, Seemungal TA, Patel IS, et al. Longitudinal changes in the nature, severity and frequency of COPD exacerbations. Eur Respir J2003;22:931–6. Greenberg SB, Allen MA, Wilson J, et al. Respiratory viral infections in adults with and without chronic obstructive pulmonary disease. Am J Respir Crit Care Med2000;162:167–73. Stockley RA, O’Brien C, Pye A, et al. Relationship of sputum color to nature and outpatient management of acute exacerbations of COPD. Chest2000;117:1638–45. Spencer S, Jones PW, GLOBE Study Group. Time course of recovery of health status following an infective exacerbation of chronic bronchitis. Thorax2003;58:589–93. Donaldson GC, Seemungal T, Jeffries DJ, et al. Effect of temperature on lung function and symptoms in chronic obstructive pulmonary disease. Eur Respir J1999;13:844–9. Eccles R. An explanation for the seasonality of acute upper respiratory tract viral infections. Acta Otolaryngol2002;122:183–91. Sethi S, File TM. Managing patients with recurrent acute exacerbations of chronic bronchitis: a common clinical problem. Curr Med Res Opin2004;20:1511–21. Skwarska E, Cohen G, Skwarski KM, et al. Randomised controlled trial of supported discharge in patients with exacerbations of chronic obstructive pulmonary disease. Thorax2000;55:907–12. Chu CM, Chan VL, Lin AWN, et al. Readmission rates and life threatening events in COPD survivors treated with non-invasive ventilation for acute hypercapnic respiratory failure. Thorax2004;59:1020–5. Competing interests: JAW is Editor in Chief of Thorax.